In 2004, Paddy was honoured for his life and work and links with Greece by the American School of Classical Studies at Athens. A report of the evening appeared in the summer 2004 edition of the Gennadius newsletter. War hero and renowned writer Sir Patrick Leigh Fermor was honored in June at the Gennadeion Trustees’ Second Annual Awards Dinner. Knighted this past February, Sir Patrick published his latest book, Words of Mercury, earlier in the winter. Regarded by many as one of the finest writers of the twentieth century, in Greece Sir Patrick is famed as the war hero who parachuted into Nazi-occupied Crete in World War II, capturing its German commander. After the war, Sir Patrick eventually settled in Greece near Kardamyli, where he has lived ever since. His love for Greece has infused much of his writing. The evening began with cocktails in the new lobby of Cotsen Hall, followed by tributes presented in Cotsen Hall itself in an unofficial baptism of the new facility. Among the speakers were former Prime Minister of Greece Tzannis Tzannetakis, Alan L. Boegehold, Dimitris Daskalopoulos, Haris Kalligas, and, in response, Sir Patrick himself. The award was presented by Edmund Keely, the 2003 winner. After the tributes, guests sat down to dinner in the terrace in front of Cotsen Hall, transfigured by tents, lights, and flowers. 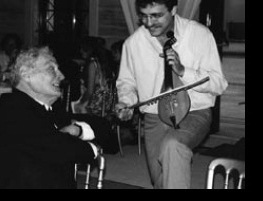 Halfway through the evening, a pair of Cretan musicians serenaded Sir Patrick and guests with mantinades. Among the 150 guests were former Prime Minister George Rallis and Mrs. Rallis; Lady Madden, wife of the British Ambassador to Greece; Mrs. Kelly Bourdara, Vice-Mayor of Athens; Mr. and Mrs. George David; Mr. and Mrs. Nicholas Egon; Mr. Sture Linnear; Mrs. Theodoti-Artemis Mandilas; Mr. and Mrs. Dimitri Marinopoulos, Mr. Panagis Vourloumis, and both the Mayor and the former Mayor of Kalamata, where Sir Patrick is an honorary citizen. Co-organizers for the evening were Mrs. Margaret Samourkas and Mrs. Lana Mandilas. Thanks to underwriting from The Samourkas Foundation, the evening raised $29,000 for the Library’s gardens. A copy of the newsletter with more pictures can be found on the American School of Classical Studies at Athens website, or downloaded from the blog archive here. This entry was posted in Paddy in the News and tagged Athens, Gennadius, Greece, Patrick Leigh Fermor on October 6, 2012 by proverbs6to10.